The former Bernard’s Jewelers in the Pedestrian Mall at 179 Essex St., Salem, Mass. is slated to be the new home for the Salem Arts Association (SAA) jointly with the Salem Collective of Artists and Musicians (SCAM). This pivotal space for the arts community is being made available by the Peabody Essex Museum which owns the Bernard’s property. This new venue will now be called Salem Arts Center with occupancy of the lease slated for July 1. Recently Massachusetts lawmakers passed the FY2016 state budget, which includes a $14.16 million investment in the state’s arts, cultural, and creative community. This is an 18% increase in funding over last year's $12 million Massachusetts Cultural Council (MCC) budget. Your advocacy has shown that arts and culture help build vibrant and connected communities across the Commonwealth. Over the past three years, the Commonwealth’s investment in the creative community has increased by 49% from $9.5 million to $14.16 million. • More than 250 arts leaders and supporters met with over 70 representatives and senators during our Arts Matter Advocacy Day in March at the Citi Wang Theatre and the MA State House. • Arts and cultural supporters sent 5,231 emails to Gov. Baker and the State Legislature showing them that arts matter in Massachusetts. • The creative community recruited 103 representatives and 20 senators, a total of 123 out of 200 state legislators to sign on to amendments calling for an increase to the MCC budget. Send a quick note to the governor voicing your support for the budget. Congratulations on building momentum for the creative community. Where is SAA this weekend? SAA artists are participating in the Salem Arts Walk and have exhibits at Front Street Coffee House, Adriatic Restaurant and Bar, and Lightshed Photography for the month of June. Several SAA members are also exhibiting in the juried gallery at Old Town Hall. It's going to be a beautiful weekend; come downtown and enjoy the art! 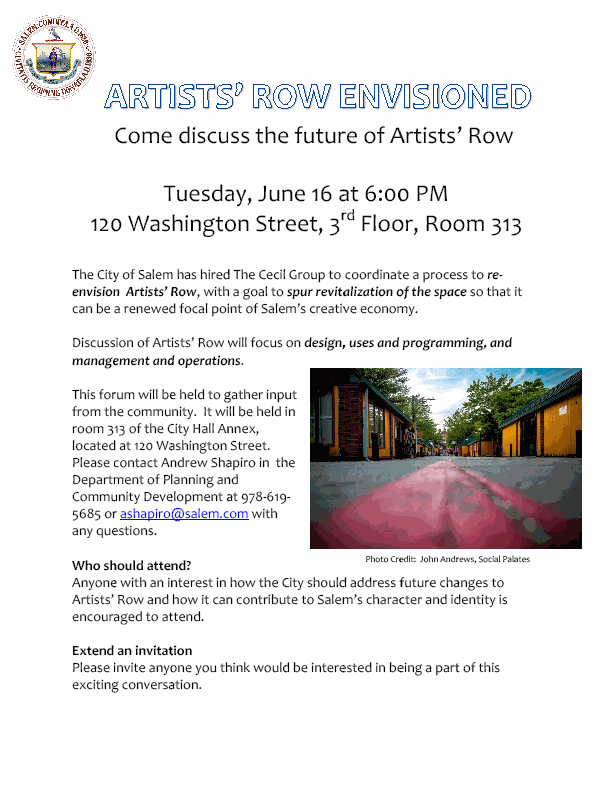 On Tuesday, June 16, at 6:00 the city will host a community forum to discuss the future vision of Artist Row with a goal to spur revitalization of the space. The discussion will focus on design, uses and programming, and management and operations. Please see the attached flyer for more information. SAA members, remember today is the day to submit your work for the Salem Arts Walk! See the attached pdf for details and submission forms. Paint for the park! Artist wanted! Artists Wanted for Trash Barrel Beautification Project! Create beautiful trash barrels to maintain a beautiful park!A project of Salem Sound Coast watch’s “Talking Trash for Clean Oceans” Initiative Do you think the amount of litter in a park decreases its value?Would you avoid a park if it was “dirty”?Would you avoid a trash bin because it is filthy?“Paint for the Park”has been created by students participating in Salem Sound Coast watch’s “Talking Trash for Clean Oceans”project to address these issues at Salem Willows Park. The goal is to reduce litter, increase the use of trash barrels, prevent trash from becoming marine debris and sustain Salem Willows’ reputation as a historically fun an awesome park.Artists are invited to submit designs that will draw attention to the trash barrels.Those that are selected will be painted by the artists on one “painting day.”Designs should relate to the environment, the ocean, sustainability, recycling or anything positive.Designs that catch the eye and encourage people to properly dispose of trash are more likely to be selected.Approximately 50,000 visitors to Salem Willows will view the trash barrel search year. Artists will sign their work and will be recognized on Salem Sound Coast watch’s web site, through social media and in print media.This project is part of Salem Sound Coast watch’s Talking Trash for Clean Oceans Initiative, a NOAA funded outreach and educational project focused on preventing street trash from be coming marine debris. Talking Trash participants are Salem High students who are participating in this semester-long service learning project. Salem Sound Coast watch is a local environmental organization working for clean and safe water. •Artists will submit a sketch of their design. Deadline for submissions is May 29, 2015. •Supplies: All paint will be supplied. Artists are also are welcome to bring their own. Oil based (acrylic; latex) paints are strongly recommended. •Selection Process: Artists will be notified by email by June 10, 2015 if their design was selected. •Bins will be painted by the artist on a specific date/time when the paint event will be held.•Submission information must include:Name Contact Information –Address, Phone, Email Artist Biography and Resume Sketch of artwork for “Paint for the Park” design To receive more information contact:Salem Sound Coastwatch201 Washington Street, Suite 9Salem MA 01970info@salemsound.org978-741-7900. SAA's first Mixed Media Mixer will be May 13th at Murphy's Pub from 6:30 - 9:30pm and every second Wednesday of the month going forward. Come for 5 minutes or come for 3 hours, but definitely come and connect! Everyone is welcome to join us, and Murphy's offers half priced appetizers on Wednesday, so it's a win-win! Please come by Kensington-Stobart Gallery to view a collection of artwork by Marblehead native Anne Brown. We're excited about a selection of her driftwood mirrors that we will have on display in the gallery as well as her driftwood sculpture, sculpture to wear, assemblage plaques and collage assemblages. Meet Anne at the artist open house from 6pm to 8pm on Thursday, May 7th. If you can't make it to the open house please come by the gallery at any time between then and May 31st. Anne collected everything imaginable from the beach, woods and fields as a child in Marblehead. Her childhood attraction to the natural world and found objects resurfaced as an adult and has led her to creating beautiful pieces of art from what is at hand. She is a member of Salem Arts Association and The Copley Society, and her work has been exhibited nationally and been illustrated in numerous publications. For more about Anne and the exhibit click here. Join in this community craft night where you’ll help make creatures, flowers, grass and any flora or fauna you can imagine. The finished pieces will be a part of the community fiber art installation, “Front Yard Street Art” at the Salem Arts Festival, June 5th-7th. The installation will be a patchwork of handmade outdoor spaces (yards) that will line Front Street during the Arts Festival. Materials will be provided, but feel free to bring your own fabric, yarn, thread, tools, up-cyclable goods too. 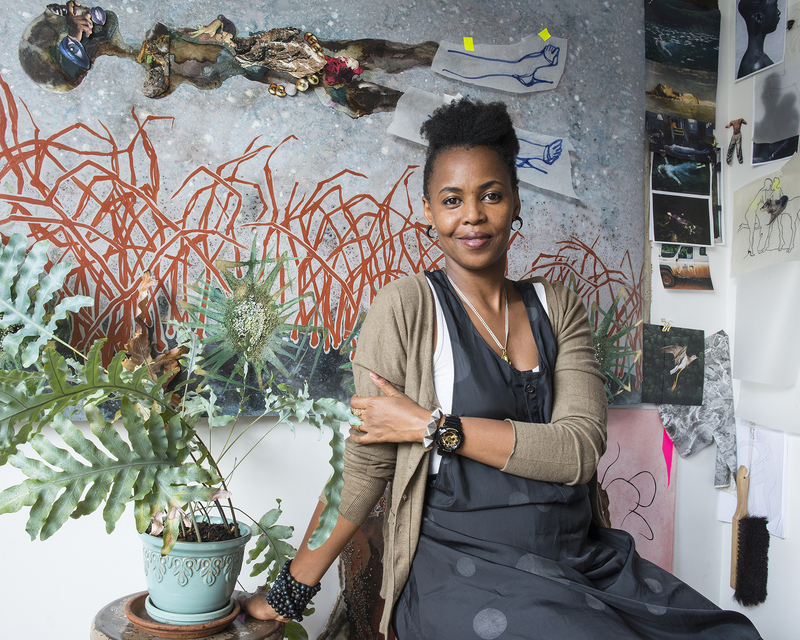 Montserrat College of Art would like to welcome the public to an artist lecture by internationally renowned Kenyan-born, New York-based artist and activist Wangechi Mutu on Thursday, May 14 at 6 p.m. at The Cabot Theatre, 286 Cabot Street, Beverly. Doors open at 5:30 p.m. Mutu has been called the most important African artist today. She is also the keynote commencement speaker and honorary doctoral recipient at Montserrat’s graduation ceremonies the following day. The lecture is free but registration is requested by contacting Margaret.Waugh@montserrat.edu. “We are extremely honored to have an artist of Ms. Mutu’s caliber speaking to our community,” said Stephen D. Immerman, president of Montserrat College of Art. “Her successful career both in the US and abroad will be inspirational to our community. We are excited to welcome her to the campus and to the North Shore.” Mutu joins a long list of illustrious commencement speakers at Montserrat including Bryan Konietzko, Gregory Crewdson, Amy Sillman, Jenny Holzer, Janine Antoni and James Rosenquist, to name a few. Mutu is the recipient of the United States Artist Grant (2014), the Brooklyn Museum’s Artist of the Year Award (2013), and was honored as Deutsche Bank’s first Artist of the Year (2010). She received an MFA from Yale and BFA from Cooper Union.She will be just returning to the US from her appearance at the Venice Biennale. See Mutu’s work at wangechimutu.com. For further information, contact Jo Broderick at jo.broderick@montserrat.edu or 978.867.9613. Full press release document and photo by Kathryn Parker Almanas.